WalletHub analyzed the 150 largest metropolitan statistical areas in the US to determine where the most educated Americans are choosing to settle. They analyzed 9 metrics including educational attainment, the percentage of workers with STEM jobs (science, technology, engineering, and math), doctors per capita, public school rankings, and the average quality and size of universities. San Jose came in a very respectable 7th place. 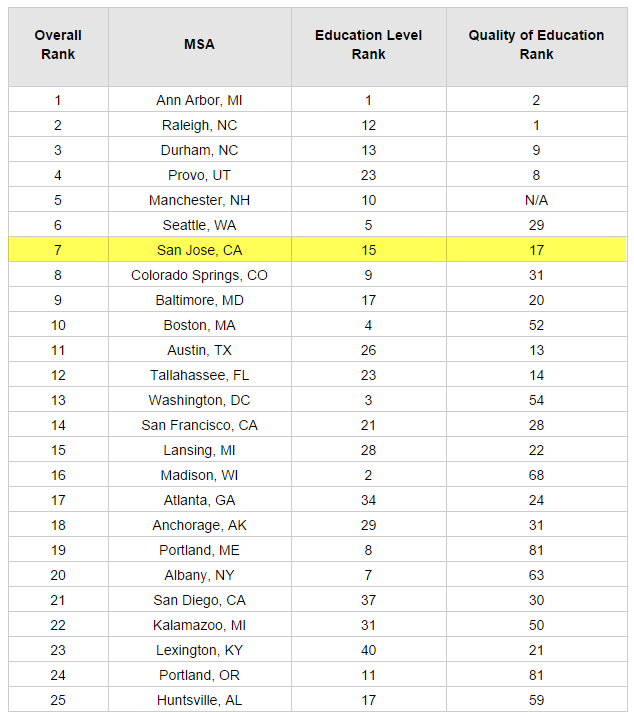 Outside of college towns, only Seattle outranked San Jose. SF was far behind in 14th and New York was all the way down in 51st place. San Jose also came in 1st place nationally when it came to the percentage of workers in STEM jobs. See the top 25 below or head over to the source link to see the full list.